OK, the pictures in the graphic I snagged and posted above are from political voting data. Apparently, people think this invalidates the point I was making. IT DOES NOT! I could post whatever I’d like, a picture of Buggs Bunny if I felt like it: but that would NOT invalidate the argument. You need much more than this to defeat my assertion. And that is a simple fact of logic and right reasoning. Now, these maps do not lend themselves well to the point at hand. One has to actually look at them and do some additional research before it becomes apparent that the majority of these shootings happened in large urban areas. Then one has to go and check those areas to find that the majority of these areas typically vote Democrat. And while this does not provide sufficient cause to conclude their is a definitive causal effect between mass shooters and the political Left in this nation, never the less, it is a correlation. HOWEVER, the indirect evidence that there is likely a strong connection is found when one actually tries to find data on this aspect of mass shooters. All recent mass shooting shooters were liberal Democrats? Do Mass Shooters Vote Democrat? The other likely connection here is that those mental health issues are connected to the disconnect from society and any meaning to life people feel when they do not have some religious foundation in their lives. As much as the Left likes to object, the rejection of or “conversion to human desire” in religious matters is prevalent on the Left — much more so than on the Right. What’s more, psychiatrists and sociologists established the connection between faith and a sense of personal well being a long time ago. This is not an issue open for reasoned debate, only to political revisionism. So, if you have followed me this far, understand this: that picture at the top of the page may be a voting result map, but it does NOT negate the assertion of this post and — if you allow that the original composer of the graphic was likely just lazy — it is still loosely accurate. The attacks on the picture and not the issue actually support the pictures claim. It’s called strawman, people. They are wolves who only prey upon the weak. Criminals are bullies, who avoid those that are self determinative and will exact a “price” for transgression. The map on the left seems just the 2004 county-by-county presidential results, not gun violence; Source, for comparison. You think you actually have a point? Because that first map doesn’t actually use gun violence data. Actually, yes. Not only do I “think” I have one, the data agrees. Notice how they all correspond to major urban areas — the same urban areas that appear as blue on the map you object to? In my sociology classes, we called that a correlation — and in this case, it supports the point being asserted. If the data agrees then why didnt you use an actual map that represents your point? Even if the other links you posted prove your point you still deliberately used an irrelevant voting map and lied saying it was about crime. That first map *still doesn’t use gun violence data. * It’s still just a copy of the 2004 election results at the county level, that’s been falsely labelled. And there’s more crime in urban areas … because (read this slowly, moving your lips if you have to) that’s where more people are. That’s the correlation. The first map would only prove that if you paired it with a crime map. Actually, the higher crime rates are in the jurisdictions with the most restrictive, or basically, gun bans, for LAW ABIDING citizens. The jurisdictions with the least restrictions for law abiding citizens have the least amount of crime. Criminals are more afraid of an armed citizen/would be victim than they are of police/law enforcement. Gun laws only affect those who ABIDE by laws. That would be, the law abiding citizens. Soooo, when a jurisdiction passes gun control laws, and discourages and disarms the law abiding, then the criminals have a target rich environment in which to roam and ply their trade. Fish in a barrel. MEXICO is a great example. Drug cartels in control with soviet designed and made GENUINE FULLY AUTOMATIC WEAPONS as civilians are unarmed. Deny reality and studies by criminologists and economists all you want. However the studies have been done, and truthful and honest people realize “REASON AND COMMON SENSE”. That crime rates are higher where you have more people is pretty obvious, like saying you find more bad apples in a larger barrel. The question is what happens to the per capita crime rates. I’m not sure where you can find county-by-county maps on US gun violence. However, the Guardian conveniently published some state-by-state infographics. I’m not sure why the map shows holes in FL and AL; however, ignoring that… firearms murders are (with anomalies) slightly lower per capita in the Midwest and slightly higher in parts of the south; assault and robbery rates are also higher in the South — which tends right-wing. The relationship is much less simple than you are continuing to suggest; and, as noted, neither of the original maps accurately show gun violence. You are equivocating. That doesn’t help your case. In fact, it undermines your argument. So you’ve got a map showing the voting patterns in 2004 and a map showing voting patterns in 2012. And no map showing actual gun violence at a county level. No, I linked to that gun violence map, and explained how it overlays the maps you Lefties are objecting to, so the maps are equivalent — at least for the purpose of this argument. I think “incidents” should be “incidence”. I think that an assault weapons ban is not what our country needs, but that graphic seems nonsensical. B) I own guns and support the 2nd Amendment. 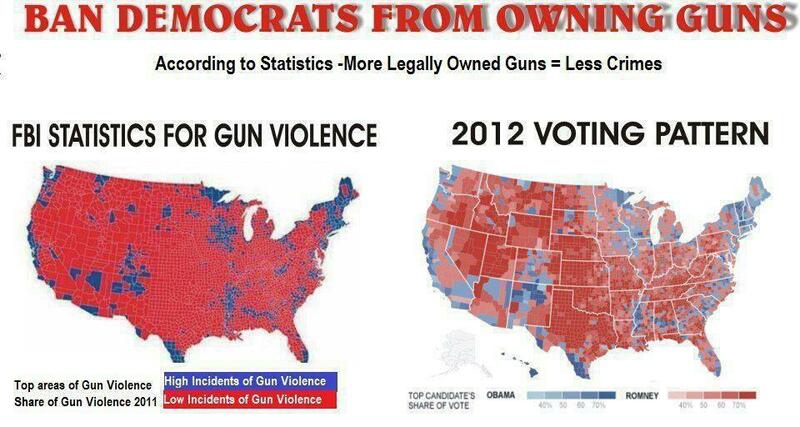 C) I’m pointing out that neither one of those maps has anything to do with gun violence. They’re both vote result maps. First, I didn’t make the diagram, but I used it because — in general — those maps DO roughly correspond to the gun violence over the past 20 years. Also, I DID post a link to the correct maps, and Kells to the raw data. Now, if this bothers you, then fine: quibble over a picture while you overlook an otherwise valid argument. I won’t stop you. They can’t do that. If they do, they lose their objection and their folly becomes apparent even to them. First of all look at vt…. not urban and has some of the lowest figures for actual gun violence, and has almost 0 gun laws… so whats up with the map here? I am a firearm owner, a rabid defender of basic human rights including the right to self-defense, and I routinely make interesting and pretty graphics documenting how “gun control” is so much nonsense (examples are here). That said, employing the graphic at the top of this post as a way of supporting the pro-rights side of the argument is a mistake. To begin with, that graphic is a bald-faced lie. In truth, the “FBI Statistics for Gun Violence” map is exactly the 2004 Presidential election map. Unsurprisingly, counties that voted for the Democrat candidate in 2004 also voted for the Democrat candidate in 2012. Secondly, so far as I know, the FBI does not publish county-by-county statistics of any kind of violent crime, much less firearm-related violent crime. Individual states do, but you would have to comb through them individually, and that still puts the “FBI Statistics” claim as a lie. Third, as others have pointed out, Vermont has some of the lowest violent crime and firearm-related crime in the country, yet we are to believe it has “High Incidents of Gun Violence”, just like Chicago? Come on. Now, if you want to look at the national level of “gun violence” versus gun ownership, I did that in the above link. If you want to look at the national level of violent crime versus Brady scores, another gentleman did that. But, please, if you are going to support individual rights and freedoms, do so with actual, honest statistics, rather than made-up fabrications. And, of course, by the same token, my individual rights are not dependent upon any statistics, numbers, or facts. I have not killed nor harmed anyone, so no one has standing to infringe upon my rights :). Um, yeah they do, The problem with their stats is that they lump them all into one cute little bundle called crime statisics. This could account for any number of weapons being used. I dig silly B.’s graph, and I find them truthful. One need only look at what the SCTOTUS’ decisions were and the outcome that played out in D.C. and Chicago to see the change, er, hope and change. The FBI does publish county-by-county crime statistics? Could you perhaps provide a link to them? I would love to develop an honest version of the above image. And that is the thing; it does matter what you ‘find truthful’ – the above image is demonstrably a lie. Granted, it may be a lie that fits with your preconceived notions, but it is still a lie. Linoge – Actually, the UCR (FBI) does gather and maintain information from the counties. The below link is from the UCR from the Bay County Florida Sheriff’s Department. Awesome, thanks :). Was not aware of that, and will have to bookmark it for the future. Unfortunately it would appear as though some counties are significantly better at reporting than others, and, worse, the FBI does not break out the data by weapon used, just Violent Crime as a whole. Which still leaves us with no source for the left side of that image. Yeah, was kinda disappointed that these results are more generalized, but the issue is the FBI depends on the local counties and PDs to report their own information, and its up to these local forces on how they classify the crime. Thanks, FL! I did not find the FBI graph so helpful……Now, on to important matters: Who shall we be tonight? I’m feeling the “Frankly,my dear,I don’t give a damn” Rhett. What do ya say…………Scarlett? You’re welcome, my dear! No, that’s your line – isn’t it? Rhett, Rhett… Rhett, if you go, where shall I go? What shall I do? Joe, your argument was very well taken. There are always leftist commenters who not only need to see things in black and white in oversized letters, but they need the data stamped on their forehead because they might forget it by noontime. Back during the Bush reign of terror, I did a laborious overlay of those counties with radio stations that broadcast Amy Goodman’s “Democracy Now” show versus the counties that voted Democrat in the last election and there was, with remarkably few exceptions, a dead on match across the country. It was hard to tell whether the broadcasts had followed the population into an area or vice versa, but the correlation was unquestionable. Unfortunately, while I used to listen to Amy Goodman every morning, religiously, she has chosen to pick and choose which topics are of relevance, while other hosts have sailed right past her. She had virtually no discussion on 9/11. Anyway, I would have preferred that the left side chart was, as you mentioned, FBI produced, but your argument for supporting your conclusions was otherwise sound, particularly those about religion. Not being a religious person, myself, I am, however, very spiritually oriented and have seen the damage done as secularization erodes the foundation of that social “connective tissue” that binds individuals with others within their functional community for a common purpose. Of course, when you mention the possibility that those on the left have been the victims of their own flawed ideology, or of not knowing the difference between “freedom of religion”” vs “freedom from religion”, they will be the first to cry nonsense …….. and then ask for more data on the issue because they couldn’t see what was right in front of them. And therein lies the problem; their lack of “connection” threatens everyone and we see the level of frustration and disconnectedness in not only every mass shooting, but every shooting. It just so happens that the “vehicle of expression”, guns, happens to address the same vehicle that our founders had chosen to “hopefully” guaranty our freedom as a last resort, so it is no wonder why the globalists have been so eager to legislate them away. Anyway, nice piece. I just found this article and will have to check out your other stuff. THANK YOU! This site exists to promote discussion among people such as yourself: well reasoned and well spoken. Whether or not we ever agree is NOT the issue — just civil discourse and I thank you for your comment. I only hope that we are succeeding in doing what we want to do here at the RNL, and, since we’ve been growing slowly but steadily, it would seem to be that we are.